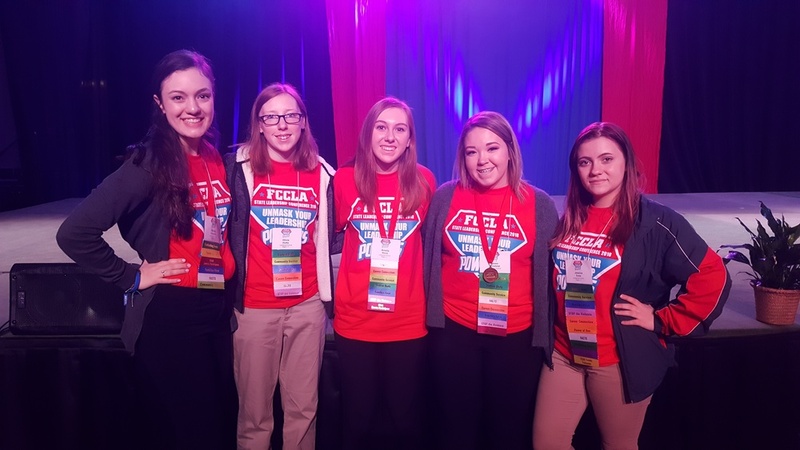 Students of Lockwood FCCLA attended the annual Missouri FCCLA (Family, Career and Community Leaders of America) State Leadership Conference that took place March 11-13, 2018 at Tan-Tar-A Resort in Osage Beach, Missouri. There were more than 1,600 students and teachers in attendance. This year’s conference theme was “Unmask Your Leadership Powers.” The conference featured speakers and workshops on topics such as preparing for college and careers, leadership skills, anti-bullying programs, and technology’s impact in education, careers, and on the family. In addition to leadership training, chapters and students received honors and recognition and more than 640 students competed in STAR Events (Students Taking Action with Recognition). Lockwood FCCLA was recognized for completing FCCLA national programs Career Connection, Student Body, Community Service, Families First, Families Acting for Community Traffic Safety, and STOP the Violence. The chapter received second place in Missouri in STOP the Violence for the FCCLA Kindness Week led by freshmen members and assisted by officers. This program’s focus was on increasing kindness to decrease bullying. Lockwood FCCLA members also received individual recognition. Jessica Dubs and Rachel Schnelle were recognized for completing all five units of FCCLA national program Power of One. Units include A Better You, Working on Working, Take the Lead, Families Ties, and Speak Out for FCCLA. Raven Winefeldt received gold in the Chapter Service Project STAR event for chapter project “The Gift of Reading.” Amelia Stone received gold in the Leadership STAR event where she created and implemented a plan to improve her leadership abilities. Rachel Schnelle received silver in the Life Event Planning STAR event where she planned for moving into a dorm room.